Forgot to mention that I chose the lineup at a recent wine tasting at one of my favorite local establishments. Check out a review here to see what was in the affordable, "go-to" wine list (with the disclaimer that I had to stick with said establishment's distributors, so a couple of wines I wanted didn't get on the list - check comments for that). Yeah, I know, where have I been? Acknowledging that I have nothing profound to say at the moment, and not wanting to speculate about whether obstructing health insurance reform, frustrating financial industry reform, or blocking the importation of inexpensive pharmaceuticals is the more egregious and cynical move by the Senate, I offer you this review of a fine wine dinner I enjoyed at Feast Restaurant recently (disclaimer: I received no compensation of any sort for this review). The dinner featured the wines of Rodney Strong, a winery I'll admit I had only a passing knowledge of previously. The Strong family founded their winery in 1959, being only the 13th winery in Sonoma County. In 1989 the Klein family purchased the winery, but they have endeavored to keep the “family-owned” winery concept going. In addition, they are serious about sustainable practices in their viniculture, including their installation of a 766 kW, 4,032 panel solar electric system, the largest solar array in the wine industry. Our reception wine was a 2007 Sonoma chardonnay, another winery owned by the Klein family (putting out mostly value-priced wines). This was an unoaked chardonnay, with a little pineapple tartness to it. It was light, easy to drink, albeit with a short finish – a fine summer quaffer. All of the wines poured with dinner were Rodney Strong Estate wines. 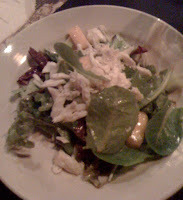 The first course was a crab salad with pears and melon and a Sauvignon Blanc vinaigrette. The crab was excellent, with straight-up clean and crisp crab flavor. The wine was the 2008 Charlotte's Home Sauvignon Blanc (named for the late founder's wife). It was almost effervescent (someone described it as having a “ping” to it). The pairing was smart, with the wine enhancing the melon flavors of the salad. The second course was a sausage stuffed quail with potato au gratin and a pomegranate pinot noir butter sauce. 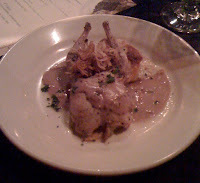 The quail was moist and not too gamey, the entire dish was well conceived and executed, and the sauce was yummy-rich. Naturally, the wine was a Pinot Noir, 2008 Russian River. It was silky, with some floral and cherry notes as well as a hint of smokiness. (For those of you who care about such things, it recently received a 91 from Wine Enthusiast). 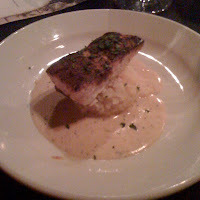 Next up was blackened salmon with butternut squash risotto and a Cajun cream sauce. If you're old enough (like I am) to remember the 1980s phenomenon of “blackened anything”, you'll recall how badly this cooking technique can overwhelm any dish. Not so fast, my friend. This salmon was expertly cooked (medium rare to rare), with a spiciness that definitely had a cumulative impact but wasn't overwhelming. The sauce was like an elegant remoulade, and the entire dish was well-balanced. The wine was the 2007 Chalk Hill Chardonnay, which had some oak up front but then the fruits (apple and spice, primarily) took over. It was a very good pairing with this spicy course. A digression for you wine geeks out there – the Chalk Hill region saw its first planting in 1965, and became its own AVA (American Viticultural Area, akin to the wine appellations/growing regions of other countries) in 1983. As you might guess, the name Chalk Hill comes from the chalky, white ash volcanic soil in the area, and the minerality tends to produce very nice white wines. Back to dinner. Course #4 was a braised veal loin with roasted root vegetables (beets, sweet potatoes, turnips and parsnips) and caramelized onions. The veal was meaty and provided a solid backdrop to the great veggies and an amazing sauce (a reduction of the braising liquids, I would suspect). 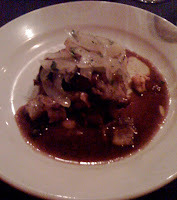 The entire dish was like a sophisticated barbecue, being a great balance of sweet, savory, and smoky. Our table wanted a baguette to soak up the sauce! The wine, a 2006 Alexander Valley Cabernet Sauvignon, hit my palate with flavors of plum and light pepper, with some dark berries also. Even though it came in at 14.4% ABV, it wasn't overwhelming, but it did stand up to the meat quite well. 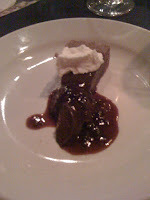 We closed the evening with a dessert of chocolate ganache in a pecan (I think) crust with a cherry sauce. This was rich but not too heavy, although one of my tablemates described it as “completely decadent in every way”. Maybe that also included the paired wine, a Knotty Vines 2007 Zinfandel. This one really is an “old vines” zin, with some of the original planting dating back to 1904 (it was from the Russian River and Alexander Valley regions). At 14.9%, it was definitely sweet, but not bad; the cherry and chocolate flavors of the wine paired very well with the same in the dessert. Overall, I was impressed with this dinner. I have found recently that prix fixe paired wine or beer dinners can lack a bit in their execution, even if the conception is solid. That was not the case here; the cooking was spot on throughout, and the pairings were well considered. Kudos to Feast's relatively new Chef Larry Searson, proprietor Teri Rogers, the Rodney Strong wine rep Heather Hanks, and the whole crew for this endeavor!